"Midsummer Night's Dream" artwork decorates a pebble garden at George Mehl Foothills Park. 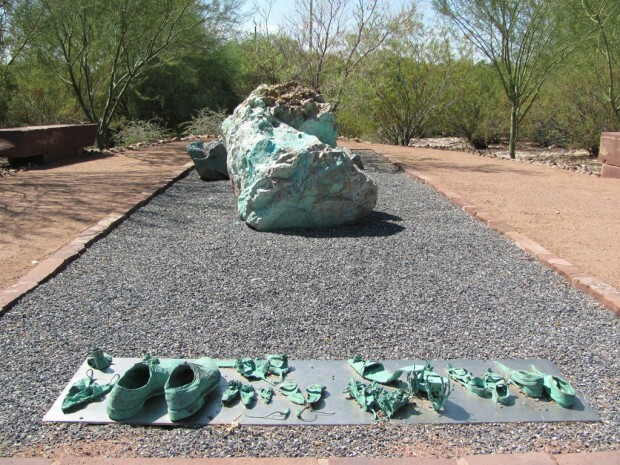 The bronze shoes of people and fairies are "left behind" as visitors escape the real world for a little while. To some, it may resemble a cell phone tower, a saguaro cactus, a solar-power generator or a palm tree. In reality, the structure at the Wilmot Road entrance of Park Place, 5870 E. Broadway, is artwork, placed there during the mall's renovation 10 years ago. Benjamin McCorkle, operations manager for General Growth Properties Inc., the parent company of Park Place, said his assumption was that it was placed there to go with the mall's theme of palm trees. Sierra Kormanik, an employee of AT&T Corp. at Park Place, described the structure as abstract. "I know they've been trying to make the mall look 'deserty,' " she said. "It kind of looks like a Picasso version of a palm tree." The structure is topped with light bulbs that are automatically activated at night and stay on for one hour after the last movie ends at the Century 20 theater, McCorkle said. "We leave the lights on for safety reasons as people leave the theater," he said. Farina Danielson, an employee at the Dillard's store at the mall, said she likes looking at the structure. "It looks very pretty," she said. "It's like a landmark." Jeanne Lewis comes to Tucson every winter from Canada, and she often drives by the structure. She said she had never previously seen something made like this. "I asked different people, but no one knew what it was about," she said. A similar structure greets visitors at the mall's entrance on Chantilly Drive, but McCorkle said the one on Wilmot is more elaborate and has more lights. Jerry Stuttz, a shopper at Park Place, said it looks like a saguaro with flowers coming out of the top. "I have no clue what it is," he said. "But I guess it fits in with the topography of the place."